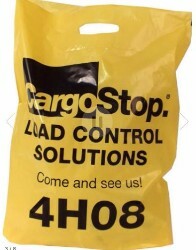 This most popular of bag styles is ideal for a variety of uses. 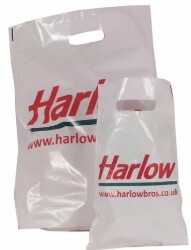 The handle section is punched out of the body of the bag and is either varigauge (double the thickness of the carrier bag body) or patch reinforced, to provide extra strength. The Aperture Handle is popular in exhibition arenas and with retailers - as it provides high definition print quality at a reasonable cost. A wide range of sizes and colours makes it the first choice for many businesses. Material: BIO POLY Photodegradable LD Plastic As Standard, HD Plastic Available. 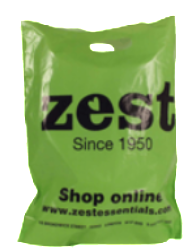 Bag Sizes: Wide Range of Standard Sizes. 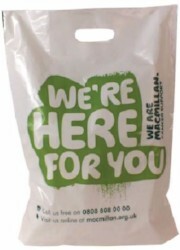 Bag Colours: Wide Range of Standard Coloured Film. Bag Thickness: 180/360 Gauge As Standard, Heavier Gauge Film Available. Print Method: Flexographic: 1-6 Spot Colours, Full Process, 100% Ink Coverage Available. Further Options: Security Seal Closure - Ideal For Retailers.